SNEAK A PEEK AT GREAT SPRING/SUMMER 2011 IDEA BOOK products - including amazing deals on new stamp sets and the January Stamp of the Month when you buy the new Wings Workshops on the Go Kit! All of our Workshops on the Go come with paper, accessories, and an exclusive stamp set designed specifically for the workshop projects. 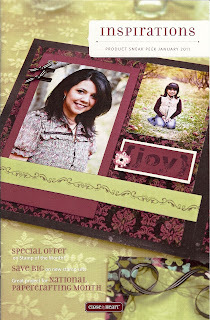 - The stamp sets featured in the Inspirations Brochure at a deep discount. - The January Stamp of the Month at a substantial discount or even FREE! Get your hands on an Inspirations Brochure to find out all the details about these fabulous savings by contacting me today! To schedule your own party or come to a card class this month to get your discounted and/or free goodies, give me a call or send me an email. (425.255.3731). Friday, January 28 at 6:30pm.